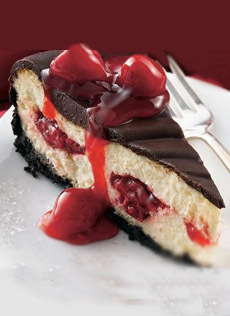 Cherry cheesecake with chocolate accents. Photo and recipe courtesy Betty Crocker. Next in our choice of cherry recipes for Washington’s Birthday (February 22nd) is a cherry cheesecake with a twist: a chocolate crust and chocolate glaze. Prep time for this Betty Crocker recipe is just 35 minutes, plus another 5 hours and 50 minutes for baking and chilling. You can make this recipe ahead of time and freeze it. To do so, first bake the cheesecake; cool and glaze. Freeze it until the glaze is set. Then wrap it tightly and freeze it for up to 1 month. Before serving, unwrap and thaw the cheesecake in the fridge for 4 to 6 hours. Make it again on April 23rd, National Cherry Cheesecake Day. 1. PREHEAT the oven to 325°F. In medium bowl, combine the crust ingredients; mix well. Press into the bottom and 1 inch up the sides of an ungreased 10-inch springform pan. 2. BEAT the cream cheese in large bowl with an electric mixer on medium speed until smooth. Add 1 egg at a time, beating well after each addition. Beat in the sugar and almond extract until smooth. Add 1/2 cup whipping cream; blend well. 3. SPOON 3-1/2 cups of the cream cheese mixture into crust-lined pan, spreading evenly. Carefully spoon 1 cup of the pie filling evenly overthe cream cheese layer (reserve remaining pie filling for the topping). Spoon the remaining cream cheese mixture evenly over the pie filling. 4. BAKE for 1 hour 5 minutes to 1 hour 15 minutes or until the center is set. Cool in pan on a wire rack for 1 hour. 5. MAKE the glaze: In 1-quart saucepan, heat 1/2 cup whipping cream to boiling over medium-high heat. Remove from heat. Stir in the chocolate chips until melted. 6. LINE a cookie sheet with waxed paper. Remove the side of the springform pan. Place the cheesecake on the paper-lined cookie sheet. Spread the glaze over the cooled cheesecake, allowing some to flow down the side. 7. REFRIGERATE at least 3 hours or overnight. Serve topped with the remaining pie filling. Some brands of pie filling are distinctly better than others. A safe bet is to pick up an organic brand. The extra cost is worth it. 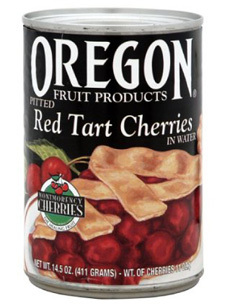 For a luxury experience, we use a jar of sour cherry pie filling from Chukar Cherries (it’s $14.95). But if your discriminating palate doesn’t like any canned cherry filling, it’s easy to make your own with just 20 minutes of prep time, and 1 hour 10 minutes of cook time. Make your own cherry filling with fresh or frozen cherries, or canned cherries in water. Photo courtesy Oregon Specialty Fruit. 1. PLACE the cherries in a medium saucepan over medium heat. Cover and simmer. After the cherries lose considerable juice (several minutes—stir occasionally), remove from the heat. 2. COMBINE in a small bowl the sugar and cornstarch. Pour into the hot cherries and combine thoroughly. Add the almond extract and stir. Return the mixture to the stove and cook over low heat until thickened, stirring frequently. 3. REMOVE from the heat and let cool. If the filling is too thick, add a little water. It it’s too thin, add a bit more cornstarch.